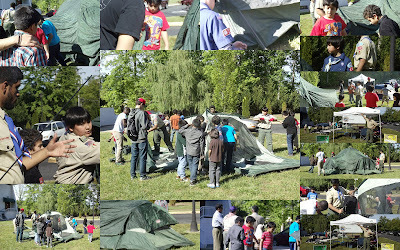 Join Scouting efforts were underway on April 29, 2012, while the ICNVT held their Annual barbecue. The event was also attended by the FBI Washington Field Office (WFO) who provided an information presentation to help build bridges of trust and communication between the FBI and the Community. The presentation was part of a community outreach program designed to engage the community in a positive manner. The FBI's Assistant Director in Charge James McJunkin, who is also the Director of the WFO, attended to help explain the mission and work of the FBI across it various Divisions to the community. The newly established ICNVT Scouting program was in force, recruiting Cub Scouts and Boy Scouts. Information was also collected for those interested in Girl Scouts. For more information about the ICNVT Scouting program, please send an email to icnvt@muslimscouting.org.